I’m inspired by Mother’s Day. 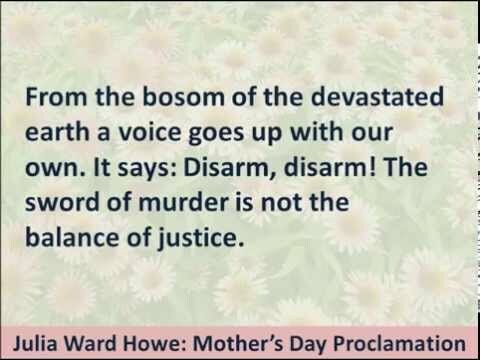 It’s wonderful to know that this is not, after all, a Hallmark holiday, but one that has its roots in compassion, healing, and opposition to war and violence. I’ve griped on here quite a bit about how alienating I find consumer capitalist culture, so to be reminded that one of the buy-things-to-show-you-care holidays actually has its origins in radical anti-violence activism and to see that it is actively being reclaimed this year by women of color activists gives my heart some serious joy. in the ruins of western civilization. is that the worst predators are human. no more. We need a human technology. drums, voices, strings. Grass underfoot. we’ve been downpressed. No more. of Earth working. Grass underfoot. shake out from this chrysalis. Wings. we’ve none of us known before.